This morning, at a press conference held at the Lake Merritt BART station in Oakland, officials from the Metropolitan Transportation Commission revealed a regional transit plan for the Bay Area. Just days after announcing revisions to Transportation 2035, the current regional plan for the nine Bay Area counties, the Commission announced that it will now discard certain features of that plan. Planners now offer a replacement plan that will put the Bay Area on a different path, including transit infrastructure that will serve the region for decades to come. What was it that prompted MTC to develop a new plan? The plan is indeed bold; and, surprisingly, the plan now strongly disfavors some projects that it previously appeared to support, including the controversial BART extension to San Jose. East Bay (link) and San Francisco (link). “A second tube will not only increase core capacity, it will dramatically improve the effectiveness of our regional rail network. It will bring in trains from Sacramento; it will furnish a direct connection between the Peninsula and the East Bay; and it will bring Oakland into the state’s high speed rail network,” added Heminger. “But it will also require billions of dollars that are not currently available. Engineering and piecing together the necessary funding will be time-consuming, so MTC has put planning for a second tube at the top of the list of regional priorities.”* Goodwin continued, explaining that the new tube presents the opportunity to build a second San Francisco BART line with track connections to the existing subway. “The new line will expand BART’s coverage to include South of Market, Van Ness, and the Richmond District. Stations will be built in Alameda and at Jack London Square, and a fourth track will be constructed in downtown Oakland. MTC also plans to fund infill stations along existing BART lines. 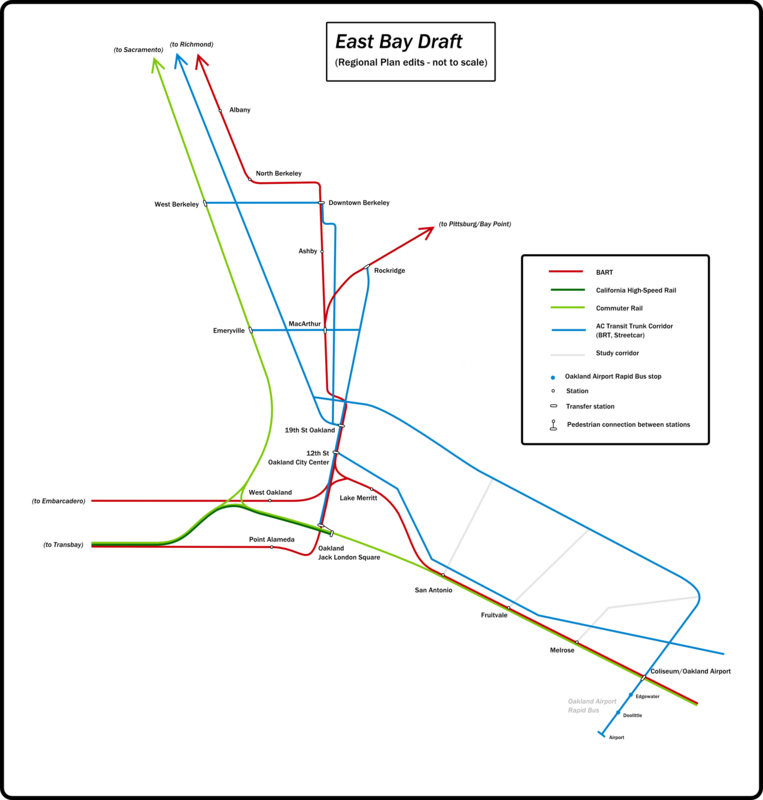 The infill stations, combined with the new San Francisco line, will double the number of BART stations in the urban core, making it much easier for transit-dependent riders to use BART as a true metro system.”* The accompanying MTC report* included two maps, one of the East Bay, and another of San Francisco. * None of these people actually said any of these things, nor was there a report — April Fools. The “we realize our errors” should have tipped me off, but you had me until halfway down. Yeah, in retrospect I probably ought to have put that in a bit further down. But if that doesn’t ring an alarm bell, then the part about spending regional dollars well probably will! It’s a really sad statement about the state of transportation planning in the Bay Area that this is so obviously an April Fools joke. It’s just too… reasonable. You totally had me on that one. I should’ve known when it said the San Jose BART boondoggle was no longer a priority. Well done sir. It makes too much sense. You had me. very nice. too bad it is only a dream. god. I think I’m not alone in wishing it wasn’t an April fools joke. why is this way of thinking so difficult for MTC? I’m not sure if I should laugh or cry. Great post Eric. Seriously though, that quote from Bates isn’t far off from what he thinks. Unfortunately, Bates is clearly an outlier on the commission. ian: far from alone — on here, at least, it appears to be near unanimous. Too bad none of us happen to sit on the Commission. Becks: that’s why he got the final word! 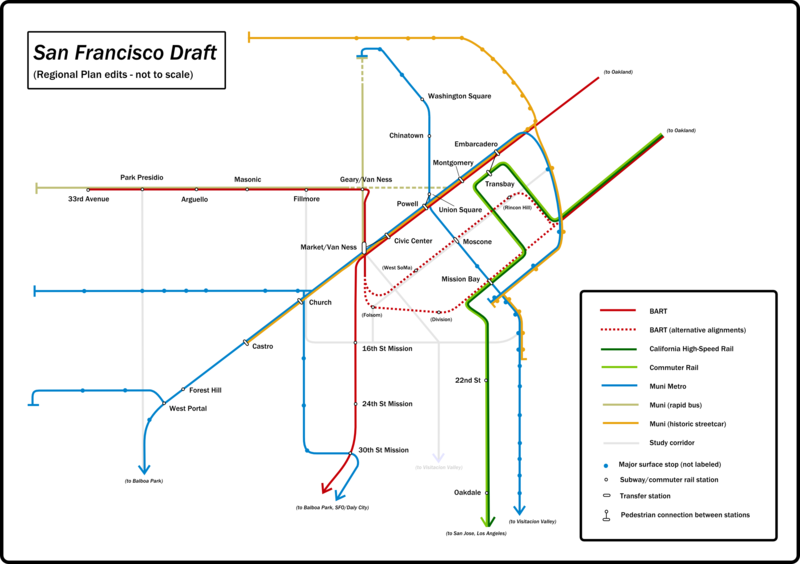 I was thinking the other day about extending Bart to the Golden Gate Park (if they ever did a Geary line). I wonder what the ridership would be like, considering it would provide much greater accessibility to the rest of the Bay Area. I bet it would be popular. A GG Park station would require a spur off of this Geary line, but then it’s also a pretty good shot south on 19th Ave. to Daly City. That would be another big project, but it seems like it could have a pretty revolutionary effect on transit share for the west side of town, linking to the L and N lines. Thanks for the word on your blog, will be interested to check it out later. You had me until the third paragraph where you mentioned disfavoring BART to San Jose. damn… only thing in there that was lame was the oakland airport bus. Alex: the purpose of the rapid bus is to replace MTC’s proposed Oakland Airport Connector, which has a funding gap, and has been abandoned by the private partners who were supposed to cover much of the necessary funds. A bus solution is less glitzy, but more cost-effective. Glad to hear that you like the rest of the map, anyway. You had me even though I knew it was coming! Who’s sending this to Steve Heminger?